This paper will show evidence of how socio-economic forces in a Mexican patriarchal enclave in Kennett Square, Pennsylvania, prompts men and women to share responsibilities inside and outside their household, which, in turn, causes phonological changes in their speech. The paper draws on Mexicans’ narrations collected seven years apart: in 1995 and in 20021. Here, their stories will guide the account of social and phonological change. Because men and women work outside the house, some changes have occurred in their households. It is no longer the wives’ duty to prepare the children to go to school or to feed them. Now, men have to participate actively in those traditional house chores that were prescriptive to females in Mexico. One informant states, “I start working early in the morning. My husband dresses our children and prepares breakfast for them before going to work; his shift starts later.” This has transgressed their traditional patriarchal behavior; men are the breadwinners who do not have to do house chores or to look after children. Women are stay at home moms who receive their family with freshly made food. Here, in Kennett Square the male cannot support his family with his sole income. A male worker said, “It’s not possible. No! It’s not possible to support a family with one income, or at least not with this job. One doesn’t make enough money to pay rent, bills, food. No, there’s no way!” Or, “Women have to work here; they have to help their husbands to support their families.” The male’s inability to fulfill his role of provider might erode the basis for his patriarchy. At the same time, it violates the image of women as homemakers, circumscribed by domestic routines (Nash, 1999). Two linguistic variables3 are selected here to exhibit the phonological change that seems to relate to the social change described above. The first is the simple vibrant /-r/ in word final position for example in words like “lava[r]4 pañales” ‘to wash diapers’. The second is the alveopalatal affricate phoneme /č/, in words like “las [č]inas poblanas” ‘the Chinese from Puebla’. Mexicans residing in Kennett Square utter some variants5 of the variables that are not usually associated with Mexican Spanish. Even though the vibrant /-r/ in coda position6, in the Spanish speaking countries, may be uttered as a trill [r#], tap [r], voiceless fricative [ř8] or voiced fricative [ř] (Dalbor, 1997: 258), in Mexican Spanish, Lope Blanch (1991) reports the trill [r#] before pause in order to give emphasis to speaker’s speech. This community pronounces the simple vibrant /-r/ as a flap [-r] and as a trill [-r#]. A flap is a sound produced by the single rapid contact of two organs, in this case “the tongue tip quickly strikes the alveolar ridge once as the airstreams passes through creating a very short stop sound” (Dalbor, 1997: 257). In contrast, the tongue strikes several times the alveolar ridge when pronouncing the trill [-r#]. The trill realization found in Mexican Spanish in the present sample does not seem to be used for emphasis7. The following are some examples of its occurrence: “tene[r)] granja” ‘to have a farm’, “informa[r)]” ‘to inform’, “deci[r)] cultura” ‘to say culture’, “esta[r)] tan cansado” ‘to be so tired’ or , “hace[r)] la cama” ‘to make the bed’. Phonological description of Standard Spanish indicates that the phoneme /č/ has a principal voiceless alveolopalatal affricate allophone8 [č] (Barrutia & Schwegler, 1994; Dalbor, 1997; Hammond, 2001). Some dialects also present another allophone, a voiceless palatal fricative [š] (Cedergren, 1973; Brown, 1976, Lipski, 1994). Affricate refers to a sound made when the air pressure behind a complete closure in the vocal track is gradually released. In this case, “the contact of the tongue blade with the alveolo-palatal region momentarily stops the airstream, but the blade quickly relaxes its contact, forming a round opening between itself and the front palate, and the stream passes through” (Dalbor, 1997: 234) words like chip or chuck are examples of the sound in English. In the fricative realization [š], “the tongue almost assumes the same position as for [č], except that the tongue blade never touches the frontal palate. The airtream keeps passing through” (Dalbor, 1997: 234) words like she or sheet can illustrate the sound in English. The following are some examples in Spanish: “llevaba chocolate” ‘she took chocolate’ or “le nombro chunde” ‘I call it chunde, a small basket’. In Mexican Spanish, the palatal fricative realization is characteristic of the northern states of the country (Moreno de Alba, 1994; Brown, 1989) not from the place of origin of these speakers. The trill [-r#] realization for the simple vibrant /-r/ in word final position as well as the fricative realization [š] of /č/ seem to be directly related to occupation9 and gender social factors on the mushroom farms. Even though the sample is not balanced between women and men; i.e. there are more males than females, interesting tendencies can be observed. There are seventeen males and ten females in the sample collected in 2002 which will be used to describe the linguistic phenomena referred above10. Out of these there are nineteen foremen: only five are women and fourteen are men. The remaining workers are five female janitors and five male pickers. 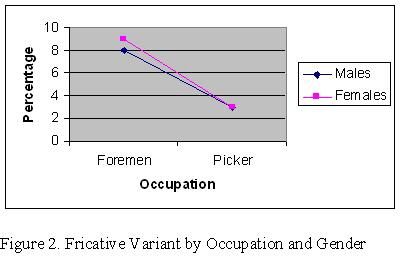 Quantitative11 and qualitative analysis of the data seem to support the relationship between occupation and gender factor groups for both dependent linguistic variables. 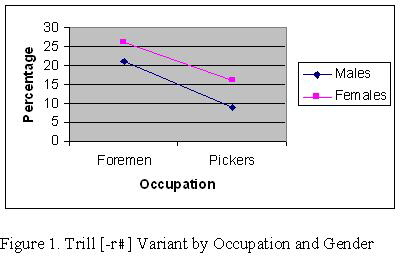 The results yielded crosstabulating gender and occupation factors indicate that foremen utter more often the trill [-r#] and the fricative variant [š]. This is illustrated graphically in figures 1 and 2. The results for the standard variants, i.e. the flap [-r] for the simple vibrant /-r/ and the affricate [č] for the affricate /č/ are not included in these figures. The percentages of occurrence for foremen uttering the trill [-r#] variant are 21% and 26% for men and women respectively. The fricative variant [š] is used 8% and 9%12 for the same groups. For the trill [-r#] variant, female foremen lead the linguistic change; prestige seems to emanate from the shared responsibility at work and at home. However, there is not really a significant difference in the percentages of occurrence of the fricative variant [š]. Thus, it might be fair to state that in phonology13, there seems to be no difference between men and women when both men and women share the same working responsibilities (Holmquist, 1988). Men and women on the mushroom farms seem to undergo a social change that reflects on the phonological changes documented here. Some women are wage-earners who have an important role as bread-winners and as skillful foremen that can increase the production in the largest mushroom production center in the country (Bastalick, 1988). Men and women are aware of the new reality where patriarchal predominance is generally no longer accepted. Male informants expressed, “women here don’t accept to be beaten or humiliated by their husbands. They don’t take any abuse. They leave their husbands because these women feel they can survive without them.” Or, “One can’t threaten a woman saying that they will leave her because it might be that she takes his luggage to the door!” It seems that while harvesting mushrooms, men and women are also harvesting a new life style. Summing up, in Cameron’s words, “a change in linguistic practice is not just a reflection of some fundamental social change: it is itself, a social change (1990: 90). 1 The results referred here for the vibrant /-r/ have already been published in a linguistic journal. 2 The mushroom industry refers to “mushroom houses” where the mushroom grows. 3 Linguistic variable is a term introduced into Sociolinguistics by the American linguist, William Labov to refer to the units in a language which are most subject to social or stylistic change. These variables are described quantitatively with reference to social class, age and gender. 4 Square brackets are used to represent sounds. 5 Variant refers to a linguistic form that is one of the alternatives in a given context. 7 As Lope Blanch (1991: 84) explains it.7 As Lope Blanch (1991: 84) explains it. 8 An allophone is a realization of a phone (a sound); they can’t appear at the same time. Some linguists explain comparing allophones with Superman and Clark Kent who can’t be seen at the same time. Neither can allophones. 9 Even though there are more social factors that were considered in the quantitative analysis, this paper only uses gender and occupation. 10 Because there was a very low percentage of an occurrence of the variants studied here in the 1995 sample, the paper will only use the results obtained in the 2002 sample. 11 In phonological analysis, Goldvarb 2001 is used to observe tendencies statistically relevant. 12 López Morales (1992) indicates that the fricative variant is a phenomenon of low occurrence; it is usually heard in Caribbean Spanish. 13 Although there is an extensive bibliography on turn-taking in conversations and male predominance in those environments (Tannen, 1993; Cameron, 2000), this doesn’t seem to apply to phonological studies.